Having so many decks means that it’s REALLY time consuming to keep decklists updated. Not every deck is on TappedOut.com, and many that are have changed significantly. That said, IF YOU WANT A DECKLIST: leave a comment or send me a message and I will find time to fix, or create, the decklists on TappedOut. Here’s the Quick Rubric I’ll use for some of the questions. How often do I want to Play it? How “Good” is it? How much do I like it? Deck Notes: This is another one that’s a pretty strong deck in Guild Wars. Deck Notes: This deck makes good use of Trostani’s life-gain capabilities. 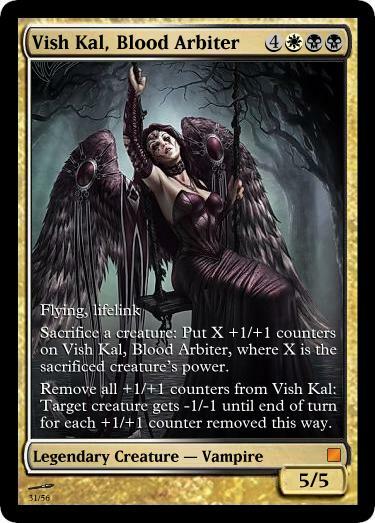 Several cards came out of an earlier version of Vish-Kal. It does play the Archangel of Thune/Spike Feeder combo. I don’t think it plays Felidar Sovereign. Deck Notes: Jasmine Boreal is my favorite OG Legend. I wanted to build a deck around her, but, since she’s vanilla, it was hard to think of a theme, so I decided she was the Fair Maiden for a Knight-tribal deck. This deck is the only one I play that really uses the Swords of Stuff and Value. Deck Notes: This deck started as a Uril the Miststalker deck that I had for awhile and decided to no longer use Uril as the commander for. It’s the WG version of Bruna in a lot of ways. This one doesn’t tend to blow people away with commander damage as quickly though. Deck Notes: Archers are a super rad tribe that catch a lot of flak. 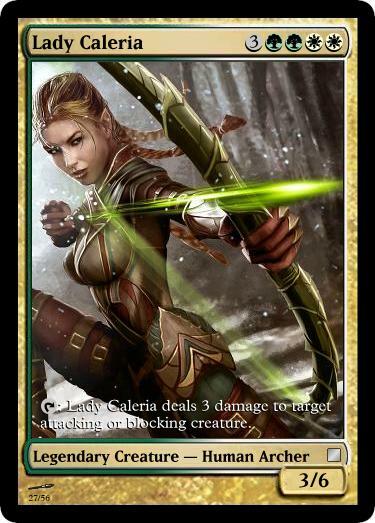 Lady Caleria, however, is super expensive and not that good. 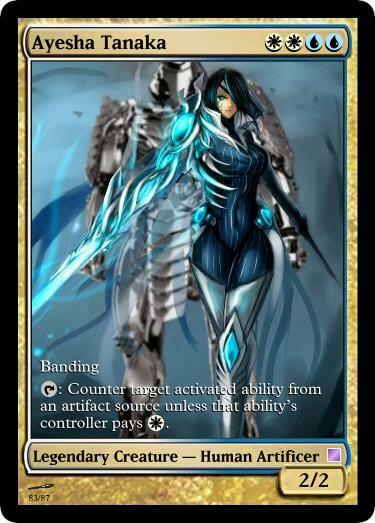 The deck also has a Banding sub-theme, because Banding is a super rad ability that catches a lot of flak. Deck Notes: I imagine that Selvala’s Parley ability is getting on the old school party line and calling people up to be friends. I imagine that Selvala is basically Tina Belcher. This has basically any “playable” Pegasus, Unicorn, Centaur, or Horse creature and then global creature buffs. It is a silly deck that has no right winning games, but it’s actually come close once or twice. It has a Happy Kitten sleeve. 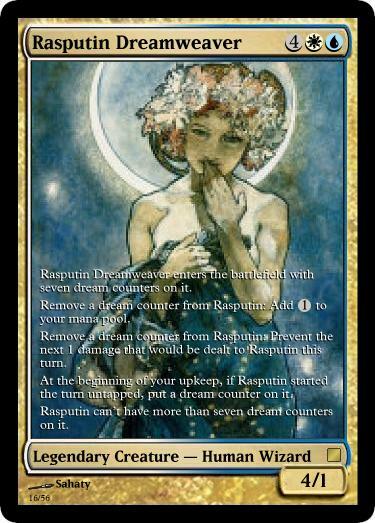 Deck Notes: Asimira is one of the few Rebecca Guay illustrated legends, so I had to build her. This deck tries to get the old school Enduring Renewal combo going, or find other ways to make Asmira big or play with counters. Deck Notes: Niv-Mizzet was the second or third deck I ever built. It was originally designed to generate a lot of Mana with Tolarian Academy and cast Emrakul (clearly that’s not an option any more). Over time I decided to remove every other creature and make it my first “Creatureless” deck. I’ve won games with this one, including one with an epic plagiarize in response to Balthor’s Graveborn Muse trigger. I may allow Mizzix to take a turn as the general. Deck Notes: Standard guild-wars style deck. Izzet is one of the more fun Guild Decks to play. Deck Notes: If it says “T: deal damage to target” it probably fits in here. Lots of fun damage-triggered toys. 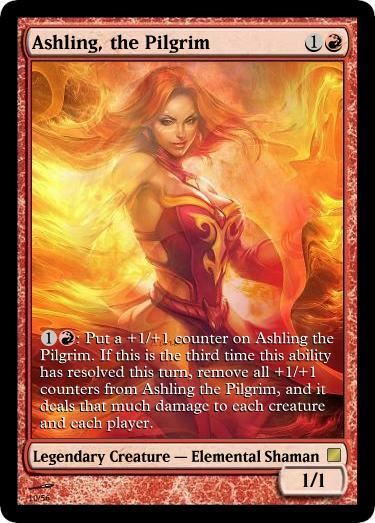 Deck Notes:Red-Blue typically means counter-burn. This deck is all about making a lot of creatures and pounding through. It uses spells to do that. Haze of Rage is a great card in this deck. It’s a bit similar to the Mizzix deck (Mizzix Goblin Tribal) I’m going to build soon, but different enough. 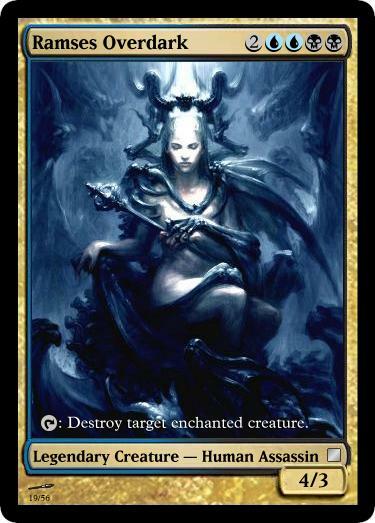 Deck Notes: Jhoira is one of those generals that people have negative expectations in regards to. I decided to build one after a good friend took his apart and sold me his cool altered copy of Jhoira. I’d been bouncing around ideas for a P/T switching deck for a long time and some of those are in here. The other thing it tries to do is get a really high storm count… in slow motion that you can see coming a mile away (a storm on the horizon). I just suspend as much stuff as possible and then use a variety of time counter manipulating tricks to try to make everything happen all at once. It’s totally not broken, but really entertaining. Yet To Be Printed U/R Artifact General (currently slotted as Keranos or Tibor and Lumia) – Thopter Tribal. Seriously Wizkids. Print a U/R Artificer. F You!, Puzzle-Box-Stapled-To-Sphinx. Deck Notes: This was my first UB deck. It started as a combination of Mill and Discard, but the discard melted out into other decks. 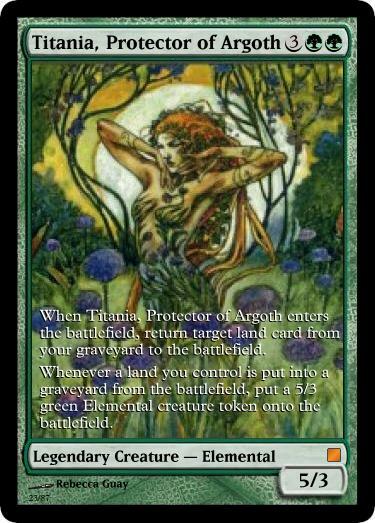 It’s also Faerie tribal, but mostly because I wanted to try to play Bitterblossom. I don’t play it much, mostly because I don’t enjoy milling people all that much, but I do really like Oona as a card. Deck Notes: The Dimir are also pretty much about Milling, which is stronger in an all-ravnica environment. Lazav is pretty fun as the general, though any of the other Dimir leaders could be played. Deck Notes: This is a deck that I always think I want to play, but never end up playing. There are lots of recursion combos as well as plenty of blinking and self-bounce effects. It also plays a bunch of artifact creatures due to the mass-intimidate ability (I might add a Thran Lens for even more fun). Deck Notes: Ramses has a pretty fun effect to use with enchantments that return to your hand when the creature dies. The deck mixes that ability with a few tap abilities (for Royal Assassin) and some Prowl effects. This is another one that I always feel like I want to play, but rarely actually do. There are some Ninja in the deck, but I might split it into a different deck for Ninja assasins. Deck Notes: This was also a spin-off from Ramses. Ship is such a silly creature type, but also awesome, and Skeleton Ship has adorable art. There are all of the Pirate creatures, plus a variety of theft-based spells (I need to add Hedonist’s Trove and Piracy). All of the Islands are Foil, and each one is different to represent all of the places the pirates have plundered. The foilness of the islands means the deck doesn’t sit quite right, so this one actually gets some House Greyjoy Kraken sleeves (that don’t shuffle well). This deck is total silly theme, but I really like it. Deck Notes: This started out as one deck that had splintered off from Thada Adel (eventually replacing it). I wanted to do a theft/copy deck mono-blue, but had an idea for a UB one as well that used most of the same cards. I figured I could just make two versions of the same deck with a little swapping of cards. Then Silumgar was announced, and I wanted to build a deck around him. The way it works is Sakashima has 25 blue copy effects and 25 blue steal effects, lazav drops the blue steal effects and adds in black theft effects, Silumgar drops the blue copy effects and adds in black theft effects, and there are 10-12 utility artifacts that play in all three. All of the versions are fun to play, but it’s a pain to swap around. *I am alternating Ally/Enemy WUBRG pairs for two colors. Deck Notes: This is my favorite deck. It’s the one I put the most care into, and the one I’m most interested in keeping updated. It’s pretty competitive (it can win on turn 3 with a god draw), and can win in a few different ways: token swarm, board clearing, combo-ing off. 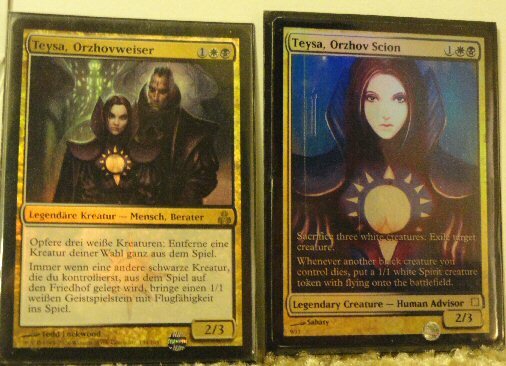 Most of the cards are in Russian, and I finally acquired a Foil Russian Teysa last year or so (the most expensive card I’ve ever purchased). There are probably a few Goodstuff ways it could be better, but I still keep a few pet cards like Nip Gwillion in there. Deck Notes: This deck is about gaining and spending lots of life. It started out with a few other W/B tricks, but they migrated to other decks. It can also win through alpha-striking with Vish-Kal. Some of my highest life-totals have come via this deck. It can be slow, though, and it used to share several cards with Teysa (mostly lands) that made it a pain to re-assemble. Deck Notes: Teysa is too awesome to just have a single deck. This one is more focused on making and having lots of spirits than comboing out or exiling your team. It also plays more to the tribal aspects. Discard is the sub theme, often tied to Spirits. The Foil German Teysa leads this one. Deck Notes: I have a Black Cleric-Demon deck (Ob-Nixilis) and a White Cleric-Angel deck (rotating cast of commander), this one plays both colors of clerics to take advantage of Edgewalker and many many Shadowborn Apostles. Deck Notes: This deck plays as many different flavors of counters as possible (except +1/+1 counters!… I tried to skip Charge counters too, but it was too hard). It’s mostly for silliness (Frankenstein’s Monster! ), but it ended up being pretty fun in it’s debut. I dream of having many individulized counter tokens to use with it. Name: The Birds. The first. Deck Notes: This was the very first deck I ever built for EDH. 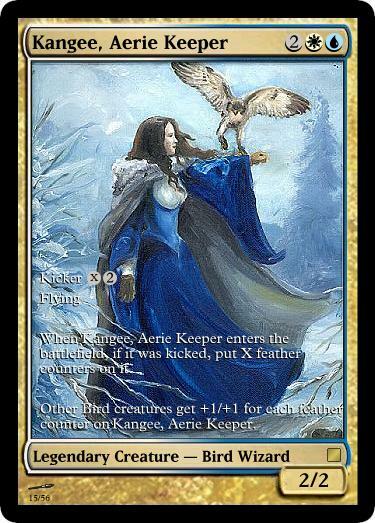 I knew I wanted a deck I could play Zephyr Falcon in, and, in a previous incarnation of life as a Magic player, I loved playing 5-color birds casual decks with Ordered Migration (which is not good in Commander). It has gone through some changes over time, mostly to make it “Birdier” and less UW good stuff. Deck Notes: I thought it was cool that Lorwyn had UW merfolk. This deck takes advantage of the Untap mechanic, and stuff that triggers upon un-tapping, as well as tapping down other things. I don’t know that I’ve updated it with the less cool “inspired” stuff from Theros. Of course it plays Wake Thrasher/Basalt Monolith/Surestrike Trident. It also has some Fish-Prison elements, but it’s not a shut-down deck or a pillow fort. Deck Notes: Like all of the Guildwars deck this is Ravnica/Return to Ravnica cards only, and no watermarked cards that aren’t Azorius. It’s one of the stronger guild decks simply due to the fact that the vast majority of the creatures are flying creatures. Its “want to play” is only low because the guild decks are mostly fun against other guild decks. Deck Notes: I wanted to build a blink deck in UW and Brago didn’t exist yet. I don’t play this one a lot, mostly because it takes a lot of effort and fiddling to do stuff. It has some combo synergy in it (DeadEye, but not Palinchron), and I really like using Gemstone Array to store up mana from Rasputin counters. 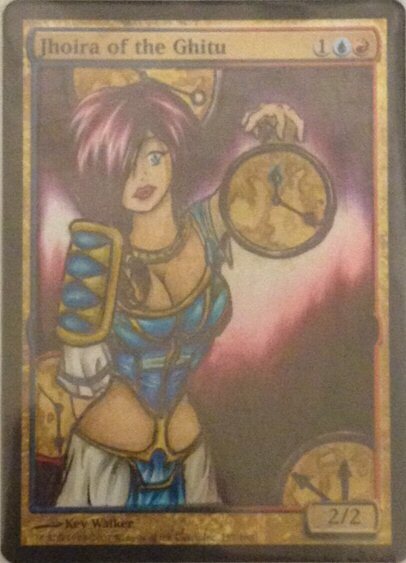 It was the first foil Proxy I ever made. Deck Notes: This is about making soldier tokens and turning them sideways to beat face. Isperia and some enchantments are there to deter people from attacking me. This is one of the few decks that I play Extra Turn spells in. This deck has actually been pretty successful. Deck Notes: Daxos was an intriguing commander. I don’t remember why I decided to make it a Creatureless deck, but it’s a lot of fun. It’s not a “get huge” voltron deck, but there are a alot of ways to make sure Daxos hits, or kills and survives being blocked, and also library manipulation and “peeking” to make wise attacks. Deck Notes: A mixture of Rebels and constellation cards, make this the Star Wars deck (a Princess Leia Lin Sivvi would be pretty cool). It’s not a strict theme deck, but there are a few cards in it that are for flavor purposes. The deck started as a way to use Ephara for card advantage, and rebels seemed a good way to do that. Also wanting to play some constellation cards led me to realizing it had a pretty cool theme (and then I got a Darth Vader sleeve in the mail, and it was awesome). Deck Notes: A Quirky activated ability, and BANDING (which is super cool) made me decide to build an Ayesha deck. Using her art as a starting point, I added in a bunch of Giant Robots (Dark and Blightsteel Colossus, etc) and decided she was a Mech Pilot. The deck is designed to suit her up and/or Band her to a Giant Robot for fun and profitt. I really dig the concept, and am excited to play this deck again. ng so many decks means that it’s REALLY time consuming to keep decklists updated. Not every deck is on TappedOut.com, and many that are have changed significantly. That said, IF YOU WANT A DECKLIST: leave a comment or send me a message and I will find time to fix, or create, the decklists on TappedOut. 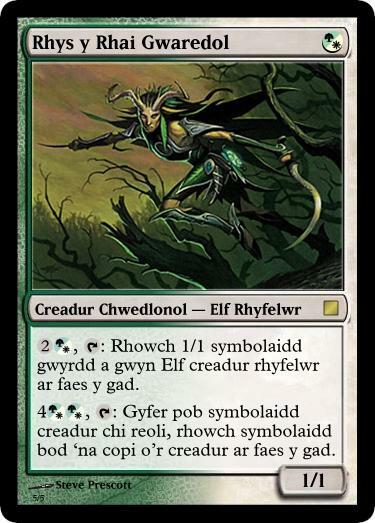 Deck Notes: My first “Mono” Green deck (no white mana except for Rhys’ hybrid symbol) is a mix of Elf Tribal and things that make lots of different kinds of tokens. I like the deck because Rhys is a family name. I dislike the deck because there are so many different tokens to keep track of, and also because no one pronounces it correctly (hint. it’s not Rice, Riss, or Rizz). I have a Custom, poorly translated Welsh, version of Rhys and am making poorly translated Welsh custom Tokens. I may de-elf the deck down to only elves that make tokens. Deck Notes: Thrun and buffs. Preferably re-useable ones. Thrun is tough to kill. Thrun also hates Fleshbag Marauder. If Thrun gets suited up correctly, he can win hard. Deck Notes: It is easy being green in this deck. Just about every creature in it taps for G because of Seton, and it loves Primalcrux and Rushwood Elemental for devotion purposes. It ramps pretty hard into some big beaters, so I guess it’s stronger than most of my decks, but it’s still extra restricted, mostly tribal. Deck Notes: I haven’ played this one a lot, but it’s a decent tokens deck. I’ve always really liked Nemata. It has a mix of trees and other plants, but mostly Fungus and Saprolings. Deck Notes: Similar to the “White Wedding” Deck, this deck plays primarily Legendary permanents, though it does have some other supporting cards. Reki lets you draw lots of things. I enjoy that I have a White legendary deck and a Green legendary deck, rather than a White-Green Sisay deck. Deck Notes: destroying and sac-ing my own lands isn’t something I normally like to do, but I really enjoy sometimes having no-lands in play in this deck. Ghost Quartering your own land for extra profit is also super fun, as is beating with 5/3 guys. This is the deck that gets my one and only Crucible of Worlds and the only deck that I play Wasteland and Strip Mine in. Mostly to use on myself. Note on Decklists: Having so many decks means that it’s REALLY time consuming to keep decklists updated. Not every deck is on TappedOut.com, and many that are have changed significantly. That said, IF YOU WANT A DECKLIST: leave a comment or send me a message and I will find time to fix, or create, the decklists on TappedOut. Deck Notes: My first red deck. Previously had a stronger artifact theme, but other decks poached cards. The main idea is to make everyone die quickly, and prevent myself from dying. 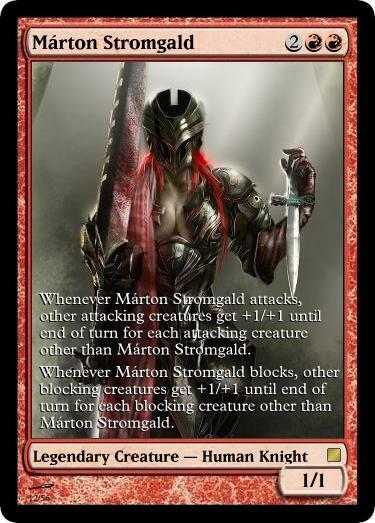 Deck Notes: Marton Stromgald was my #1 most wanted card from Ice Age, and I opened one in my first starter deck from that set. This deck is mostly about attacking with a lot of things, with a sub-theme of stuff that gets big after attacking so that Meekstone can protect me. Deck Notes: This was my first “limited CMC” deck. The idea came from Ashlings Prerogative. The deck has two versions, one that plays 8-10 land-destruction cards, and the more common one that has a minor artifact theme. I enjoy this deck, and I’ve also come close to foiling it out, though I WILL play cards in it that can’t be foiled, and there are a few that I haven’t felt like shelling out for the foils. Deck Notes: SQUEE! the general you probably only have to cast from the command zone once. 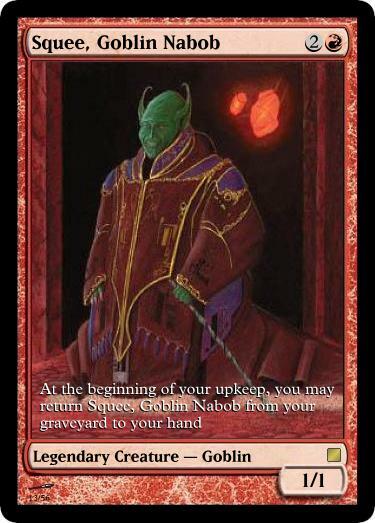 There are other Legendary Goblins in the deck, but the only other goblins beyond that are token ones. Lots of cheap-to-equip equipment that are efficient, so even if Squee dies every turn, he can be re-cast and re-suited up. Lots of fun. Deck Notes: This Kiki-jiki deck is almost entirely creatures, aside from Kiki’s boots, gloves, stick, and armor (Swiftfoot Boots, Illusionist’s Bracers, Thornbite Staff, Darksteel Plate). I will happily take out the one infinite combo creature and replace it with something ridiculous if asked. Lots of red value creatures. Plays in a similar space to Feldon, but in a different way. Deck Notes: Sort of thrown together because red spirits and arcane sounded fun AND I needed a red Ultra-Mono deck AND the Kirins are silly legendaries. Skyfire is kinda useless since it doesn’t give haste. If there were things worth using in other decks, I’d take this one apart. Deck Notes: This is almost a mono-brown deck, but I liked a lot of red spells, and Slobad is a pretty cool guy. Daretti would make it TRULY creature-less, and Kurkesh is also allowed to sub in for the general slot, but having Slobad as a free sac-outlet (and also someone to suit up with Bludgeon Brawl) makes me happiest. Deck Notes: Balthor the Stout is far weaker alive then as a zombie, however I wanted to play Dwarf Tribal. Unfortunately he’s a Barbarian Lord, so I got to mix things up. There’s a minor mountains-matter sub-theme here. Deck Notes: This was originally a Tiny Leaders deck until I realized that Commander is just plain more fun. I kept the original 5, but then added in good things that cost more than 3 that were fun to recur or mill. I enjoy it more this way. Deck Notes: I’ve tried to stick Phoenix tribal in several other decks. Latulla’s a good fit because some of the Phoenixes come back to your hand to be re-discarded. Other X-spells, recurrable red creatures, madness cards, “punisher” cards and mana ramp round out the deck.